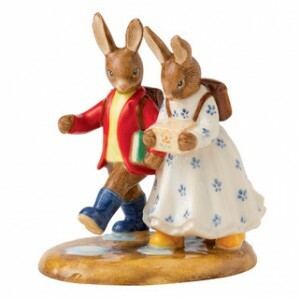 The Bunnykins family of figurines are produced by Royal Doulton. They were originally created over 60 years ago by Sister Barbara Vernon.Barbara’s father Cuthbert Bailey was Doulton’s managing director at the time and he took the drawings and created a series of nurseryware based on the Bunnykins characters. Pictured right: Royal Doulton Bunnykins of the Year 2013, Neil Faulkner has depicted two young Bunnykins as they set Off to School. Royal Doulton’s Bunnykins two annual models are full of interest and detail and are guaranteed to fascinate both the youngest and the oldest Bunnykins fan. Bunnykins Off to School, designed by Neil Faulkner, depicts two young Bunnykins dressed in typical outfits. William wears the distinctive Bunnykins red jacket teamed with a bright yellow jumper and Susan is in her favourite blue flowered dress. The first Bunnykins figurines were released in 1939 and were modelled by one of Doulton’s most famous artists Charles Noke. There were no more figures released until 1972 when Doulton relaunched the range with 12 figures all modelled by Albert Hallam. A few Bunnykins were released in 1973 and 1974, and then every year since 1981 more have been produced. NOTICE – This site is not affiliated with Bunnykins TM or Royal Doulton TM. The purpose of these pages is to provide information to collectors of Bunnykins.